The Canadian Folk Music Awards have announced their 2017 nominees, and MAZ’s ID is in the race for World Group of the Year. For more details, see the announcement at CFMA. Today, ADISQ announced its 2017 nominees. We had the pleasure to see ID nominated for Traditionnal album of the year, along with En panne de silence (Bon débarras), Nous irons danser (Galant, tu perds ton temps) and Laissez courir les chiens (Yves Lambert Trio). The results will be unveiled on October 26th at the Premier gala. Good luck to everyone! This Fall, MAZ presents its new show, ID, following the launch of its third album last Spring. 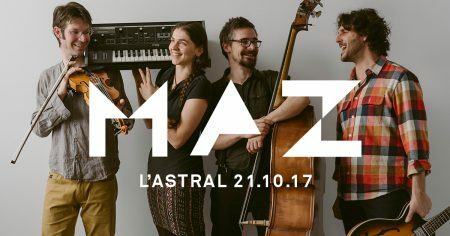 The premiere will be held on Saturday, October 21st at L’Astral, in Montreal. Buy your tickets – online or by phone! In the following days, the band will fly to Katowice, Poland, to participate to the World Music Expo’s official showcase program, the “most important international professional market of world music of every kind”!